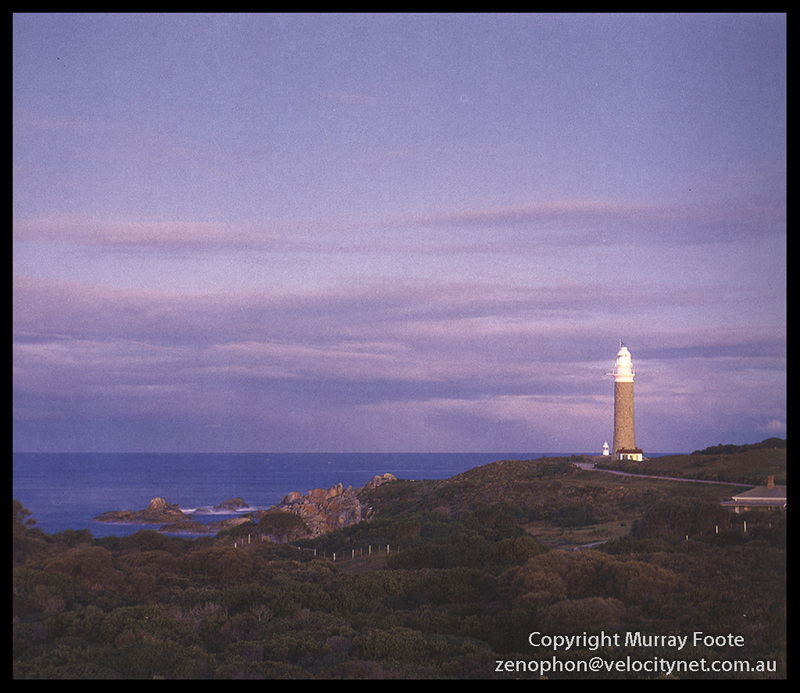 I visited Eddystone Point lighthouse, not far below the north-east corner of Tasmania, on 25th to 26th of July 1987. 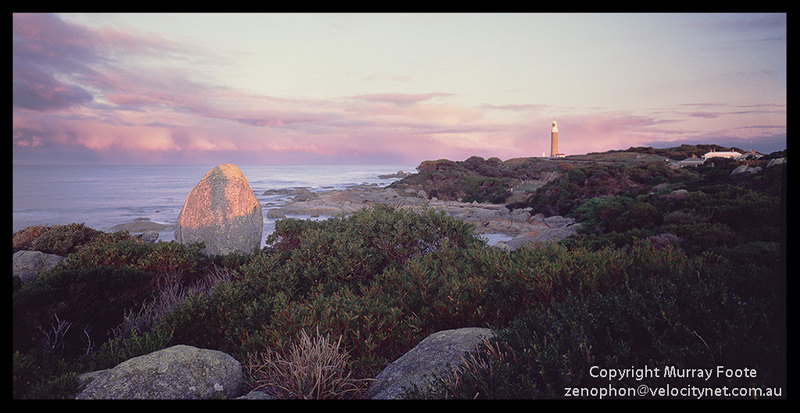 Eddystone Point Lighthouse near Sunset. The Eddystone Point lighthouse was built in 1889 and like the lighthouse at Gabo Island, was constructed of red granite quarried at the site. It is 37 metres high. It was built after several boats were wrecked on the coast and a large rock discovered hidden under the water nearby. The miniature white “tower” beside the lighthouse is a subsidiary light directed at a specific set of rocks that was discontinued after the electrification of the lighthouse. I was told several tales of sightings of thylacines when I was both at Eddystone Point and Low Head. One I remember was of two policemen sitting in their car beside the road when a thylacine crossed in front of them but they weren’t game to report it for fear of ridicule. North-east Tasmania has the highest incidence of reported Thylacine sightings. I can well believe there might still have been a few in the region at that time. 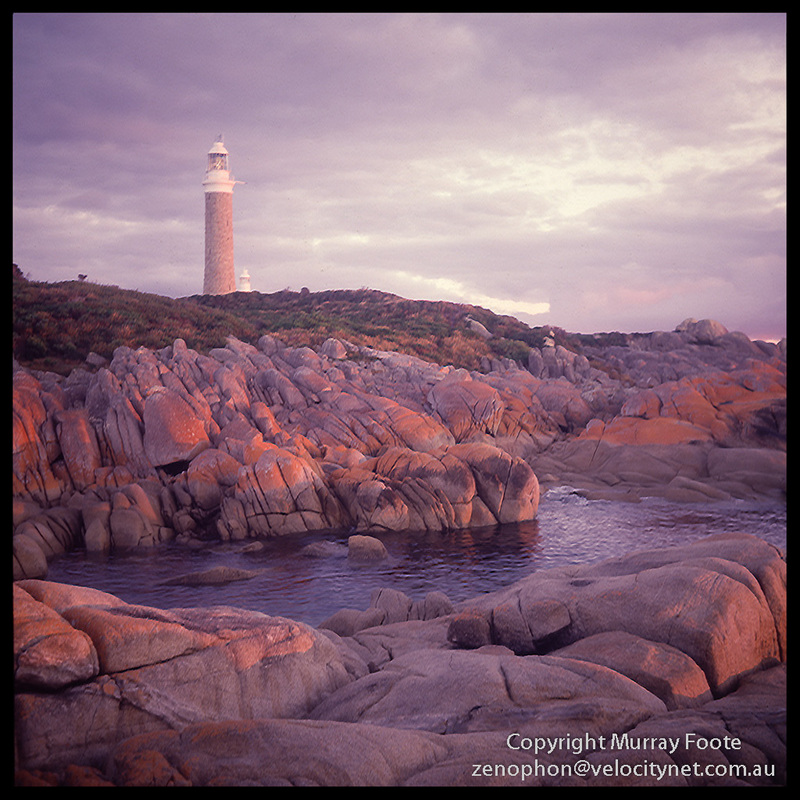 This entry was posted in Australia, From Dusk Till Dawn and tagged Architecture, Australia, Eddystone Point, History, Landscape, Lighthouses, Photography, seascape, Tasmania, Travel. I’ll just pause for a moment and say that I really like your light house shots. You’re quite right. I hadn’t even noticed though it was 26 years ago when I took it and I imagine it was quite deliberate at the time. Thanks Lois. It’s possible but not likely. They certainly survived beyond when the last one died in captivity in 1936. Scientists suggest that in the not-too distant future it may be possible to clone one from DNA (of I think a preserved fetus).